You’re almost there! After wisely spending time building foundational understanding about sewing machine stitches, you’re going to sew! Because there are so many different sewing machines, it’s impossible to share with you specific details about the stitches on your make and model of machine. The goal of this post is to provide a framework so you understand the basics of sewing machine stitches regardless of brand or model. The most basic definition of a stitch is a length of thread holding two or more pieces of fabric together. When a needle moves up and down in the fabric on a sewing machine, the top and bobbin threads come together forming a stitch. Your sewing machine may only make a straight stitch or it may have thousands of different stitch options. More than likely the number of stitches your machine makes will be a number between 1 and 10o. The brand and model of your sewing machine will determine the number of different stitches you’ll be able to sew. Many stitches are decorative, but there are several that serve a specific function. For example, if you’re sewing on a knit fabric, you can select a stitch that will stretch with the fabric. Other examples of functional stitches are zigzag stitches and blind hem stitches. When you select a stitch on your sewing machine for either decoration or function, you may need to use a specific presser foot and make changes to the stitch length and width. When lowered, the presser foot holds the fabric against the feed dogs (also called feed teeth). 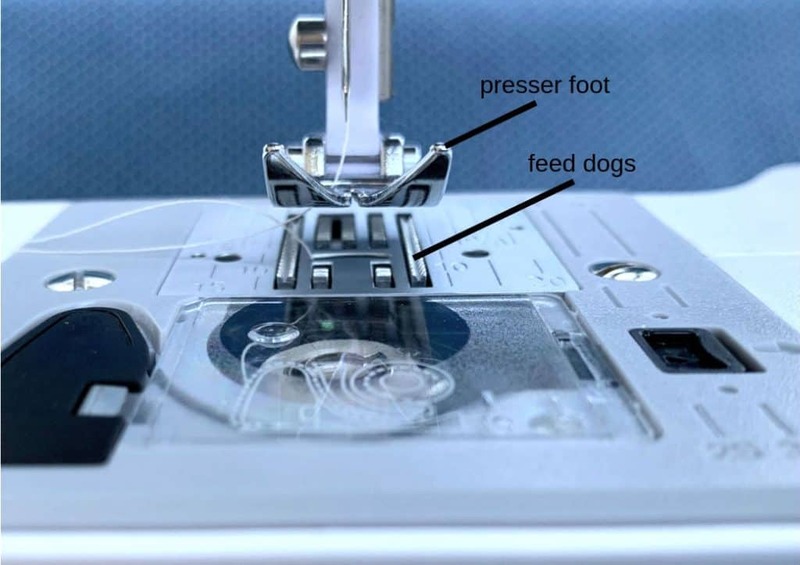 The feed dogs control the movement of fabric under the presser foot when you step on the foot control. Have the instruction manual* next to your sewing machine. 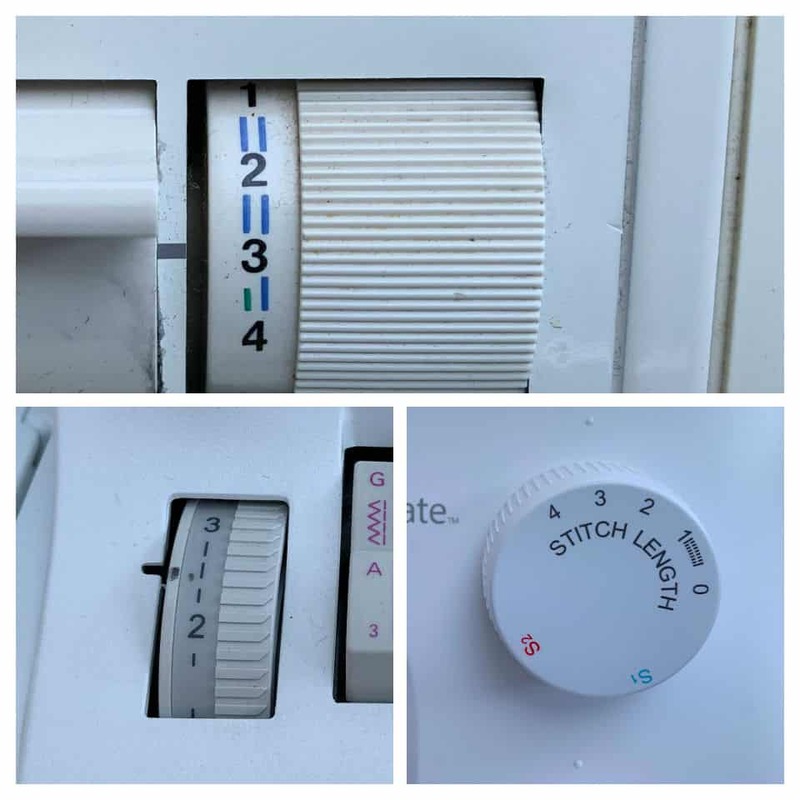 Open the instruction manual so you’re looking at the illustration(s) or the photograph(s) where the main parts of your sewing machine are labeled. The remainder of this post will provide you with general information about stitches. Refer to the instruction manual for specific details on selecting stitches, stitch length and stitch width for your sewing machine. 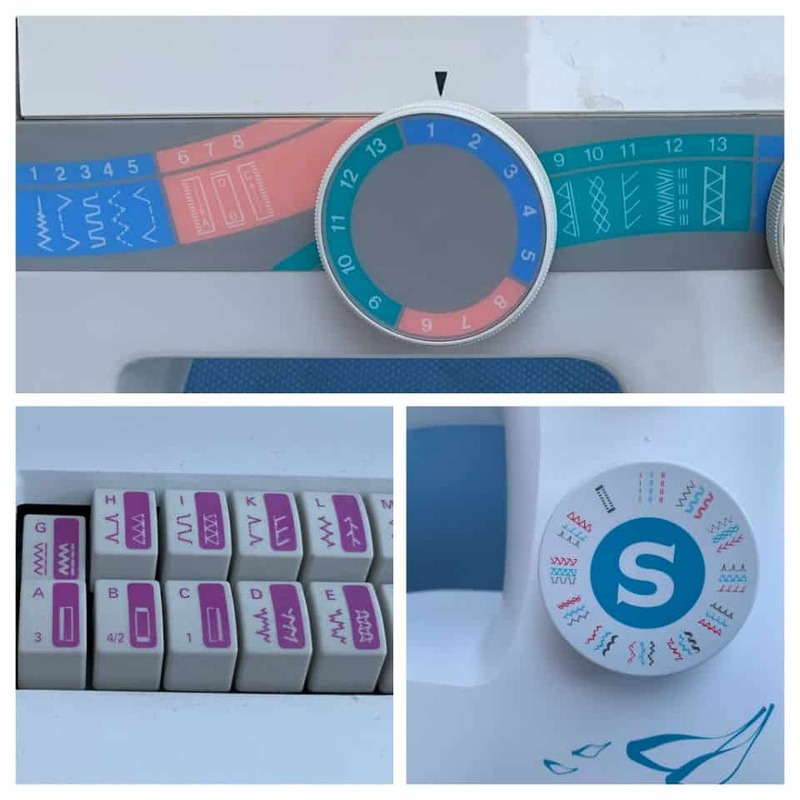 The stitch selection on your sewing machine allows you to choose the type of stitch you want to sew with. To select the type of stitch you want, you may need to turn a dial or push a button. Top: My Elnita has a dial. Bottom left: My mom’s Pfaff has buttons. My Singer has a dial. For every type of stitch, there’s a recommended length and width. Some stitches require a specific presser foot. Using the wrong presser foot may result in a broken needle. When selecting a specific stitch, refer to the instruction manual for details that include stitch length, stitch width, and the presser foot. Many sewing machines have dials you turn to select the length of the stitch. The numbers for stitch length usually range between 0-4. 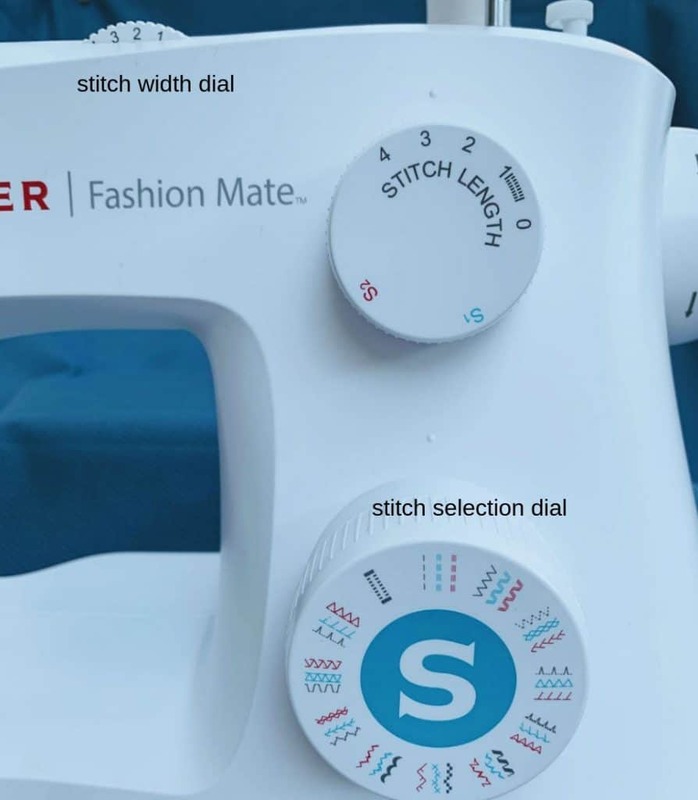 The Elnita, Pfaff, and Singer all have dials to select stitch length. A setting of zero means the needle goes up and down in one place (no length). The longest stitch is 4 (or the greatest number) on the stitch length dial. Frequently, you will set the stitch length between 2-3 to get a medium stitch. When you choose a certain stitch using the stitch selection, look in your instruction manual for the recommended stitch length. The needle doesn’t move when you change the stitch length. However, it’s a good idea to get in the habit of raising the needle by turning the flywheel toward you so it’s in its highest position before making any changes. Many sewing machines have dials you turn to select the width of the stitch. The numbers for stitch width usually range between 0-5. 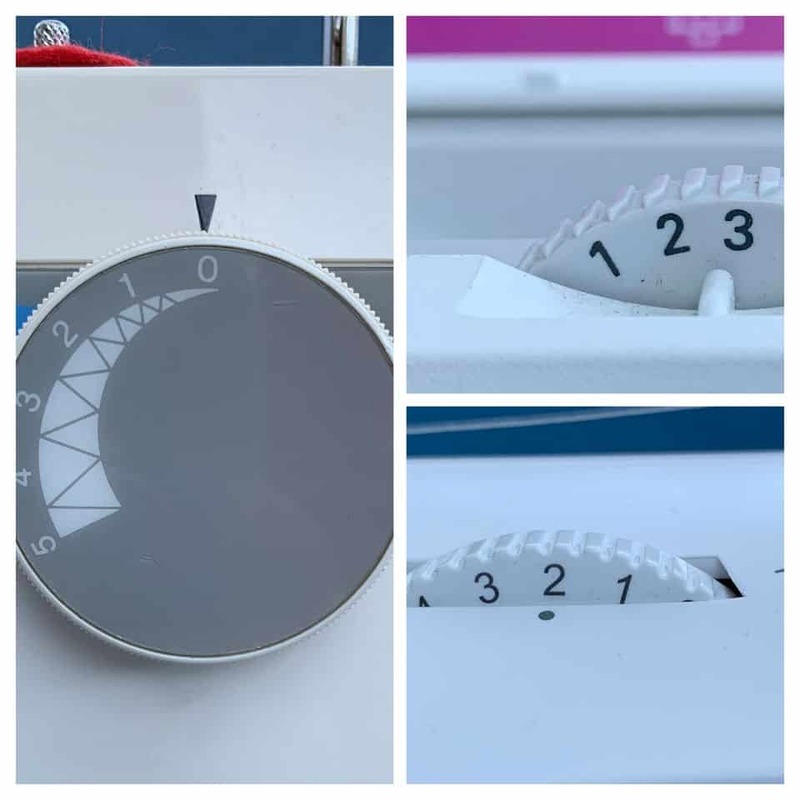 The Elnita, Pfaff, and Singer all use dials for selecting stitch width. IMPORTANT: Make sure your needle is in the highest position before you adjust the stitch width. When you select a stitch width, it actually moves the needle position left or right. If you work with different types of stitches and change the width, it’s a good idea to make sure the needle is back in the “center” when you’re using a straight stitch. That way if you’re using the measurements on the needle plate, the seam allowance will be accurate. Important: “Center” is not always the middle needle position. On one of my machines, when the needle is positioned to the far right, it’s in the “center”. Refer to the instruction manual to find out what “center” is for your sewing machine. Depending on your sewing machine, there are many options for different stitches you’ll be able to sew. Some stitches are functional while others are decorative. Each type of stitch has recommendations for length and width. In addition, some stitches require a special presser foot. When changing stitch width, you must raise the needle to its highest position. 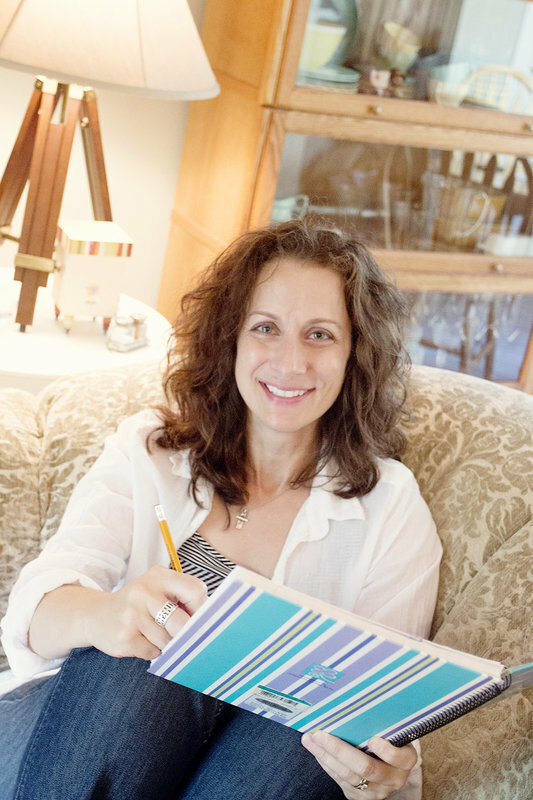 It’s a good idea to do the same when you’re changing the length of the stitch, too. This way you’ll get in the habit of raising the needle before making changes that could break a needle or damage fabric. Always refer to the instruction manual for your sewing machine for details on stitches. Let’s put all your new sewing knowledge together and start sewing straight and zig-zag stitches!